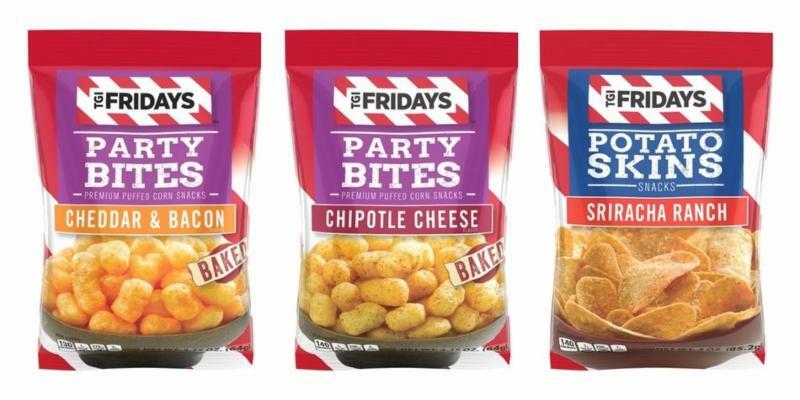 Inventure Foods has expanded its TGI Fridays snack line with new varieties including Chipotle Cheese and Cheddar & Bacon Party Bites and Sriracha Ranch Potato Skins. The Chipotle Cheese and Cheddar & Bacon Party Bites varieties will be packed in 2.25-ounce bags. The Potato Skins will be available in 3-ounce bags. Chipotle Cheese Party Bites is an extruded snack containing cheese and chipotle spice that gives a kick of heat. Cheddar & Bacon Party Bites is an extruded snack featuring cheese and bacon with traditional favorites in a non-traditional bite sized form. Sriracha Ranch Potato Skins features Sriracah, a popular flavor, with cool ranch. The new varieties join the existing line of Party Bites including Buffalo Ranch and Mac & Cheese.